It’s Wednesday, and I’m finally back on a regular posting schedule, so it’s time for another lesson. This week, we’re talking about what I talked about on Monday — writing while on vacation. 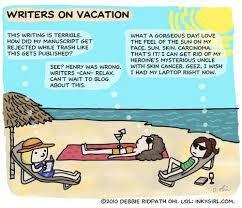 It can be hard to write on vacation, and some people choose to not. I understand and respect that. But then again, there are some of us, like me, who choose to bring along their laptop and write. I don’t know about you, but I would go insane if I didn’t write the entire time. Vacations are tiring. You get up early, you’re on the go all day, you come back to the hotel extremely tired, and you just want to go to bed. That doesn’t really leave time for writing. So what do you do? Well, if you can stand it at all, you have to force yourself to write, even if it’s the last thing you want to do. I had some nights like that while I was gone. I understand that there are some nights when you just can’t stand it. Believe me, it’s not like I wrote every single day for the two weeks I was gone. There were some nights when I was just too wiped out and couldn’t do anything. It’s hard, but if you want to write at all, you have to make yourself some nights. I guess it’s a good thing that I don’t go on vacation very often. I enjoy it, but I think I would barely get any work done. For now, I’m just trying to figure out how I’m going to get my laptop in my suitcase when I’m flying to Hawaii next year.